It will become the Cross Insurance Arena for the next decade as the Bangor-based company seeks increased visibility in the Portland area. The Cumberland County Civic Center will get a new name – and $2.5 million. 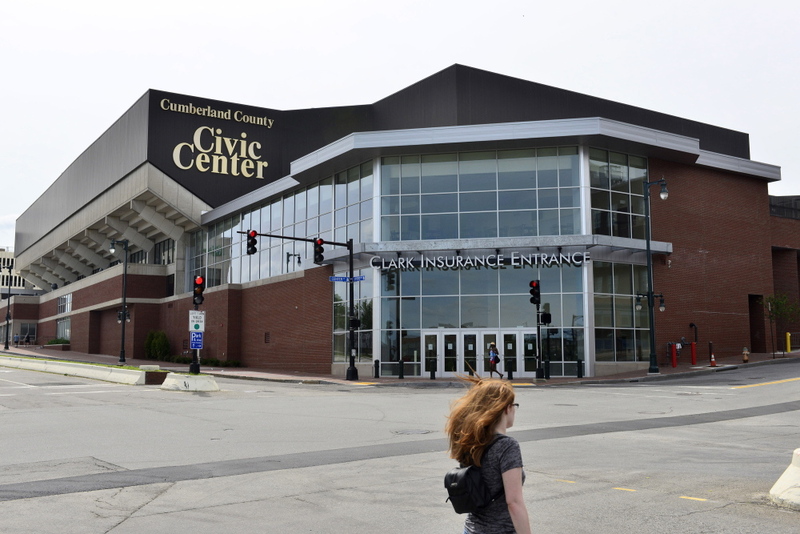 Civic center officials sold the naming rights to the newly renovated arena Wednesday for $250,000 a year for the next 10 years to Cross Insurance, which also holds the naming rights to Bangor’s new arena. The civic center will become the Cross Insurance Arena. Bangor’s facility was christened the Cross Insurance Center last year under a 15-year, $3 million deal. Neal Pratt, chairman of the civic center’s trustees, said sales of naming rights were always considered a key part of financing the arena’s $34 million renovation, which was completed early this year. In addition to Cross Insurance, Clark Insurance and Bath Savings Institution have bought naming rights, to the arena’s entrances on Spring Street. Officials couldn’t provide information Wednesday on remaining opportunities for naming rights. Some of the money could be used to pay down the bonds approved by county voters to pay for the renovation, Pratt said, although that will be decided on a year-by-year basis, depending on other revenue. Also, Cross Insurance has the right of first refusal to sponsor some events at the arena, which could further reduce operating costs, Pratt said. The deal with Cross Insurance could have created a conflict because the arena’s east entrance on Spring Street was named the Clark Insurance Entrance earlier this year under a $125,000, five-year deal for “sub-naming” rights. Pratt said Clark Insurance would have been allowed to sell back its rights, but the company’s president said it will hold onto them. Ross said Portland-based Clark Insurance saw its deal as a way to help support the civic center and gain visibility. It accomplishes those goals, even with Cross Insurance getting the prime naming rights, Ross said. Pratt said trustees discussed “industry exclusivity” with Clark Insurance during negotiations over the entrance naming rights, meaning it would be the only insurance-related business allowed to buy naming rights or sub-naming rights, if it paid more than the $125,000. Pratt said Clark Insurance “opted not to go forward” with exclusivity, so the deal did not contain that provision. Ross would not discuss details of the negotiations. Pratt said civic center officials had preliminary discussions over the prime naming rights with other companies, which he declined to identify, but ultimately negotiated only with Cross Insurance. In its naming rights deal, Cross Insurance gets a luxury box in the arena and three large exterior signs that should be visible from multiple locations, said Brent Cross, executive vice president of the family-owned firm, based in Bangor. The company was initially reluctant to discuss the naming rights in Portland because it held the rights to Bangor’s arena, Cross said. But he did some research and found it isn’t uncommon for companies to hold naming rights on multiple facilities. Naming rights for the county-owned civic center had been a testy issue in the past. The revenue from naming rights was a sticking point in lease negotiations between the trustees and the arena’s prime tenant, the Portland Pirates hockey team. The team insisted that it was entitled to a share of the naming rights revenue, which – along with a dispute over concessions revenue – led to a breakdown in the lease talks last summer. When talks resumed in the winter, the Pirates dropped their demand and a new five-year lease was quickly approved. When the trustees looked to sell naming rights in the mid-1990s to raise money for repairs and an upgrade to the sound system, philanthropist Betty Noyce stepped in and provided $1.35 million, on the condition that the Cumberland County Civic Center not be renamed for at least 10 years. Noyce thought the arena should be named for the county because the taxpayers had paid for it. Pratt said that weighed on the trustees, even though they recognized that they needed the money from naming rights to help make the renovation feasible.